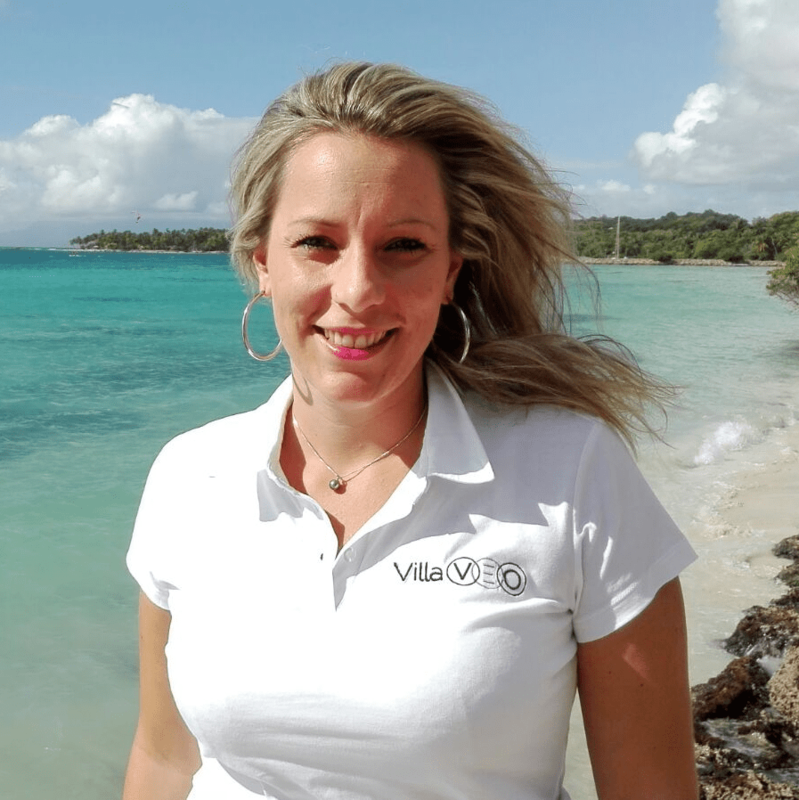 Where is Villa Tavullia located in Guadeloupe? Villa Tavullia is located in Saint-François, on Grande-Terre – the eastern tip of Grande-Terre. This luxury villa, secured by an electric gate, is located in a calm residential neighborhood. Saint-François and all the conveniences –shops, marina, golf course, etc – are only a five minute car ride away. The village of Sainte-Anne is only 10 minute driving distance from the villa. This superb architect-designed villa is located around 35 minute car ride away from the Pointe-à-Pitre airport and the nearest beach is "Anse à la Barque", 0.6 miles away. Saint-François’s central location makes it possible to easily fan out and discover the Grande-Terre. How is this luxury villa rental in Guadeloupe furnished and arranged? With 4 air-conditioned rooms, 3 double bedrooms (one with a King Size bed of 180/200 and one with a Queen Size bed of 160/200) and the other two with two separate beds that can form a King Size double bed (180/200) this luxury villa can accommodate up to 8 guest. This holiday rental is ideal for a friends and family stay in Guadeloupe. Not only does each bedroom have a private bathroom with shower and WC but you’ll also find air-conditioning system. One of the four bedrooms can accommodate people with reduced mobility thanks to its large circulation areas, toilets equipped with a lifting bar and shower equipped with a lift seat. This single storey villa with a partition less layout is offering many outdoor pleasurable spots to relax. Tastefully decorated and designed with your comfort in mind, Villa Tavullia offers pretty design touches thanks to these paintings by local and international artists. This luxury villa rental in Guadeloupe offers its guests many quality services (two safe, very comfortable bedding, American fridge, Nespresso, unlimited telephone, TV with satellite channel + international channels option...ecological and silent air mixers, and finally beach and pool towels are provided free of charge). For any stay of at least 14 days, an additional cleaning is offered. The villa provides the perfect balance between modernism and refinement. The kitchen is fully equipped and opens onto the modern living room thanks to a kitchen island.Outside, the large shaded terrace is equipped with a large table for eating out of the sun, garden furniture, a electric grill and two armchairs. The swimming pool, secured by an alarm, is lined with several deckchairs, for a tanning session, and an outdoor shower. In addition, daily breakfast delivery and additional cleaning services during the week are also available for an extra charge. At certain times of the year (Low and Mid Season), the villa can be rented for 2, 4 or 6 people. What is there to do around the Villa Tavullia in Saint-François, Guadeloupe? Villa Tavullia is only 10 minute car ride away from the Saint-François marina, the beautiful beach of “Raisins Clairs” or the international golf course. The town of Saint-François is also a jumping-off point for amazing boat excursions -- to discover the islands of Petite-Terre, La Désirade or Marie-Galante. Bakery, shops and supermarkets can be found in Saint-François. Beach enthusiasts will take full advantage of the ideal location, few minutes car ride away from beautiful beaches such as the beach of Bois Jolan. You can’t help but fall in love with this superb luxury villa rental in Guadeloupe! We were wery satisfied with villa. And we are giving 4- ( because villa is totaly new and the grass is too sparse 😊. No I am just kiding – everythink was super. Ahha so you need to come back to see the villa with more grass! Thanks a lot for reviewing the villa, hope we will have the pleasure to welcome you again! For your next vacation in Guadeloupe, we recommend you to have a look on villas and/or apartments located close to Villa Tavullia. Our selection is based on your search criteria: destination and vacation rental capacity. We are sure that we will find what you are looking for!